The primary personal objective of this study was to improve our understanding of how carbonate sedimentary environments work. To this end two different, yet similar carbonate basins were compared to establish which major controls were responsible for the carbonates sediments of the basins and their petroleum systems, including major sources, reservoirs, and seals for the pertinent time periods. A brief examination of the history of oil exploration and production for the basins is presented so as to highlight the regions' significance and to explore whether similar controls were responsible for the migration and entrapment of petroleum reserves in both basins. Illustrate how carbonates depositional systems react to changes in relative sea level and generate unique stratigraphic geometries. The deposition of the unique geometries that form systems tracts are used are utilized in the methodology of sequence stratigraphy to provide a sequence stratigraphic framework for understanding and predicting facies and their distribution within the basin. These systems tracts included the lowstand systems tract (LST), the transgressive systems tract (TST), and the highstand systems tract (HST). These systems tracts provided a conceptual framework that enabled the determination of the relationship between the sedimentary geometries, changes in relative sea-level and the carbonate sedimentation rates. Relative sea-level was demonstrably a function of the interaction of subsidence and eustatic sea-level and together produced the accommodation space for the sediments to fill. The tectonic history of each basin was reviewed in order to establish the origins of the vast carbonate deposits of these basins and the concomitant generation and entrapment of petroleum. The lithological and petrophysical aspects for the primary formations for each basin were reviewed with greatest focus being given to the Hanifa formation of the Arabian Basin and San Andres formation of the Permian Basin. The selection of these two formations was on the basis that both are very significant hydrocarbon producers and provide a good understanding of how the associated formations were deposited. The Hanifa formation is the primary source for the overlying Upper Jurassic reservoirs, while the San Andres formation contains the major lower Guadalupe producing carbonate reservoirs within the Permian Basin. A general Hanifa reservoir architecture was constructed to delineate a high frequency sequence stratigraphic model for the reservoir and identify the sequences that lead to the deposition of source and reservoir rocks within the formation. A set of 14 wells provided by Saudi Aramco was utilized for this analysis. Cross sections with interpretations of various log suites were generated and described. A general review of the both low-frequency sequence stratigraphy (2nd and 3rd order) model of Sarg (1999) and high-frequency sequence stratigraphy of Kerans and Kempter (2002) was conducted in order to analyze and describe the primary controls that lead to the deposition of the Guadalupian section of the Permian Basin. A heavy reliance was placed on published literature since no seismic, well logs or core data were available to us to utilize for further higher-frequency analysis. Finally, a comparison of these two basins was made. This includes facies found within each depositional setting (from peritidal-to-basin), response to eustatic sea level and paleoclimate, basin geomorphology, and the resultant sediments (including texture, dolomitization, cements, dominant fossils for each facies belt). Additionally, summaries have been made for the primary controls that lead to the deposition of these sediments and the accumulation and preservation of the petroleum reserves within each basin. The Upper Jurassic carbonate reservoirs of the western and southern Arabian Gulf contain of the most significant hydrocarbon reservoirs in the world . Here the super giant Ghawar field of Saudi Arabia produces mostly from the Arab Formations. 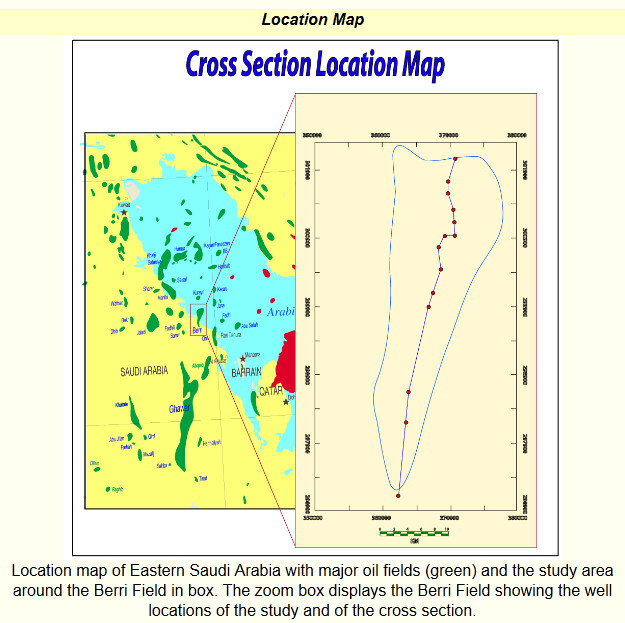 This field extends north-south for some 224 km, covering about 2,275 km2 with a vertical oil column reaching a maximum of 433 m with an oil-saturated interval extends to 83 m in the Arab-D Member (Aramco, 1959). Other giant oil fields such as Berri (the focus of the Hanifa formation study in a later chapter), Safaniya, Qatif, Khurais, Abqaiq, and others are located in eastern Saudi Arabia as well. The Arab Formation is composed of four shallowing-upward depositional cycles each representing a transition from continuous carbonate deposition to the accumulation of nearly pure anhydrite. The late Oxfordian and early Kimmeridgian Hanifa formation represents the source rocks for the prolific Arab reservoirs while the Tithonian Hith formation represents the regional seal for the underlying Arab reservoirs. In contrast the Upper Permian Formations (late Leonardian and Guadalupian) of west Texas and southeastern New Mexico carbonate shelf deposits represent one of the premier petroleum producing regions of the US, covering an area of over 300,000 square km. 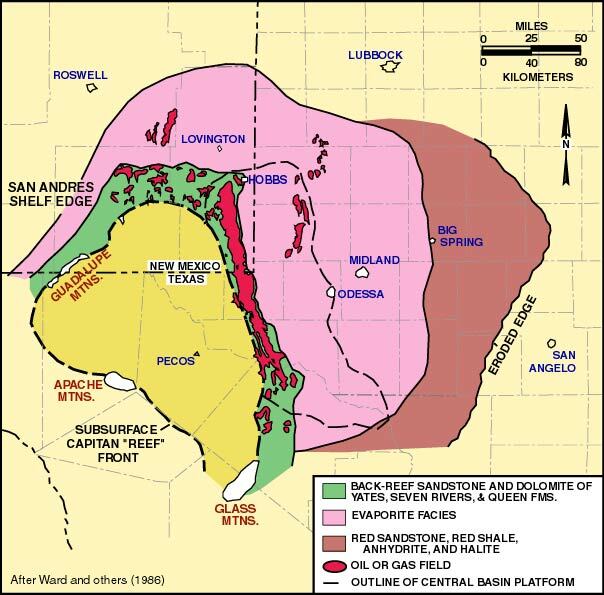 Over 40% of the oil fields of the Permian Basin produce from shelf limestones. This late Permian Basin was filled by reciprocal sedimentation (Van Siclen, 1964), so during sea level transgression and/or highstand, there was a rapid accumulation of broad carbonate and evaporite lagoonal deposits rimmed seaward by reef and/or grainstone shoals deposits, and a basin characterized by the slow accumulation of thin and widespread carbonate turbidites. Formations such as the San Andres, Grayburg, Queen, Seven Rivers, Yates, and the Tansill were deposited during these phases. In contrast during the lowstand, fluvial and aeolian deposits collected across the shelf to the margin. These deposits are complemented in the basin by thick deepwater fan sandstone sequences that include the Brush Canyon, Cherry Canyon, and Bell Canyon Formations sandstones of the Delaware Basin Group. By the end of the Guadalupian (Ochoan), a major sea-level fall induced the accumulation of evaporites, which acted as a regional seal for the underlying reservoirs. Just as in the Arabian Gotnia Basin, Scholle, (2002) suspects euxinic, relatively organic carbon-rich, basinal sediments (such as the Leonardian basinal lime mudstone of the Bone Spring Formation) were the hydrocarbon source and were deposited during late Paleozoic second-order transgressions (Sarg et al., 1999). As can be seen above, the sediments of both basins accumulated in similar settings at different geological times. The Permian Basin of west Texas and southeast New Mexico is one of the most studied in the US. There are numerous significant sequence stratigraphic studies of the upper Permian Formations including (King, 1948) USGS study in which he produced detailed geological maps and cross sections of the basin using outcrops exposures in the Guadalupe Mountain area. Scholle, (2002) and many others also have demonstrated the reciprocal pattern of sedimentation between the carbonates on the shelf and clastics of the deeper Delaware Basin . Sarg and Lehmann, (1986) used outcrops of the San Andres formation and the Capitan Reef in southeast New Mexico and 2-D seismic to identify third-order depositional sequences for these formations. Sarg et al., (1999) provided a second-order (10-20 m.y.) cycle-based hierarchy of the Permian Basin in which ten third-order Guadalupian depositional sequences were identified. Sarg et al., (1999) identified the expected lithofacies for the various systems tracts. Kerans and Fitchen, (1995) provided a detailed work on the tie between the sequence hierarchy and facies architecture of San Andres in the Algerita Escarpment within the Guadalupe Mountains establishing their vertical and lateral facies successions. Furthermore, Kerans and Fitchen, (1995) developed a new terminology for describing this chronostratigrahic hierarchical model, connecting the most detailed facies to high frequency systems tracts or higher order parasequences. The geology of the Arabian Plate has also been extensively studied but the sequence stratigraphy of the late Jurassic of the Arabian Basin is not so well known. The monumental work of Powers et al. (1966) provided a review of the major Mesozoic formation nomenclature (based on exposed outcrops in Central Arabia) in conjunction with a historical background on this naming, the major fields, the locality of outcrops, and lithology. A reference section for each formation was also presented. Murris, (1980) presented a sequence stratigraphic framework for the evolution of the Middle Eastern basins during the Mesozoic and Cenozoic. The deposition of the source-reservoir-seal and trapping of petroleum was tied tectonic character and history of the basin, the sea level position at each stratigraphic stage, and the local climate (humid vs. arid). Additionally, Murris, (1980) recognized two-basin geomorphologies that developed as a result of increased clastic influx into the basin and position of low-order sea level. These patterns were carbonate ramps and the differentiated carbonate shelves. Murris's (1980) work also presented maps illustrating the environments of deposition for each of the time periods he described. Ayres et al., (1982), Droste, (1990), and McGuire et al., (1993) described the sequence stratigraphy of the Upper Middle Jurassic Hanifa formation and concluded that Hanifa organic-rich lime mud was the source for the overlying Arab formation hydrocarbons. These above authors also observed that the source rocks were deposited in a deeper intrashelf basin within the broad Arabian Basin during a major transgression in which basal laminated organic-rich mudstones accumulated under anoxic conditions. This primary objective of this research was to establish an understanding of carbonate basins deposition in conjunction with the accumulation and preservation of hydrocarbons within them. A sequence stratigraphic framework of the Arabian Basin and the Permian Basin has been used to explain their development and pinpoint the primary controls that lead to the unique geometries of the resulting beds. This strategy can be used as a means to analyze the controls on high frequency stratigraphy in greater detail in either basins and so enables the building of a better stratigraphic framework, which can be used in the interpretation of carbonate basins.